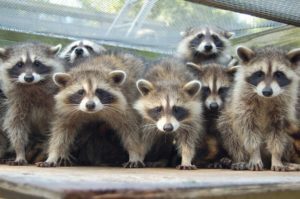 The largest bank in Canada had to close one of their branches in Toronto, after a family of raccoons took over. A spokesman for the bank said that the “masked bandits” were living in the ceiling. Bank executives were hoping that the closure would be only for a couple of days, but the animals did far more damage than originally estimated. The raccoons were evicted by professionals, and the construction crews are now starting to do the repairs. This bank has very high ceilings, so their first task was to erect scaffolding on the interior of the building. Repairs are expected to take about two months to complete. Meanwhile, the bank is directing their customers to go to other nearby branches. The city of Toronto has been battling with raccoon problems for many years. With little success by the city’s efforts, it looks like the raccoons are winning the war.